[Updated] Emergency services responded to Wellington Slip Road in St. George’s tonight [June 24] where it appears there was a crash involving a livery cycle. Bermuda Fire and Rescue service personnel tended to an injured person before they were transported by ambulance to King Edward Memorial Hospital for treatment. Traffic flow was restricted in the area while police processed the scene. Further details are limited at this time, however we will update as able. Update June 25, 11.40am: A police spokesperson said, “Around 10:50pm Sunday, June 24th police and fellow first responders attended a reported single vehicle rental scooter crash on Wellington Slip Road in St. George’s. 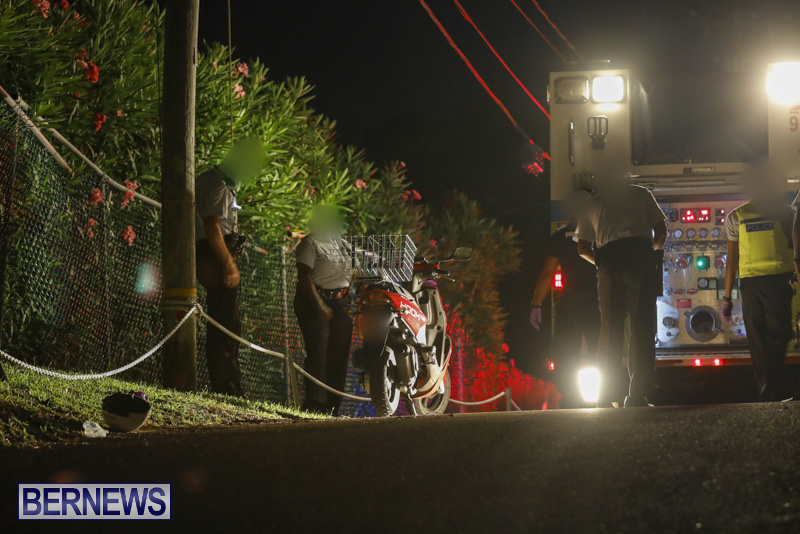 “It appears that the rental scooter rider – believed to be a 44-year-old St. George’s man – struck a low wall before continuing on to an area of grass near the roadside where he struck a metal post. “The 44-year-old man sustained a serious leg injury and was transported to King Edward VII Memorial Hospital via ambulance for treatment. “At last check this morning [June 25th] he was listed in critical condition in the Intensive Care Unit. “The rental scooter involved has been impounded as inquiries continue. Wishing them a speedy recovery.